No one may modify or patch Payroll 2019 executable files in any way, including but not limited to decompiling, disassembling, or otherwise reverse engineering the programs. You may include this program on your CD for distribution. 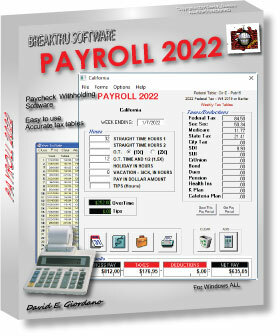 A limited license is granted to copy and distribute Payroll 2019 including on CD/DVD only for the trial use of others, subject to the above limitations, and also the following: 1) Payroll 2019 and all of its release files must be copied in unmodified form, complete with the file containing this license information. A) Operators of web sites and and such may make Payroll 2019 available for down- loading only as long as the above conditions are met. B) Vendors of user-supported or shareware software may distribute Payroll 2019, subject to the above conditions, without specific permission. C) Non-profit user groups may distribute copies of the Payroll 2019 on media to their members, subject to the above conditions, without specific permission. Non-licensed users are granted a limited license to use Payroll 2019 for a 10 use trial basis for the purpose of determining whether this software is suitable for their needs. The use of Payroll 2019 except for the initial trial use, requires registration. The use of unlicensed copies of Payroll 2019, outside of the initial trial use, by any person, business, corporation, government agency or any other entity is strictly prohibited.